Congratulations to "Erin", the winner of Tiffany's giveaway. Thank you to all who participated. Thank you to Just Romantic Suspense for hosting me today! Both books, NO TURNING BACK and TURN TO ME are only $2.99 on Amazon. 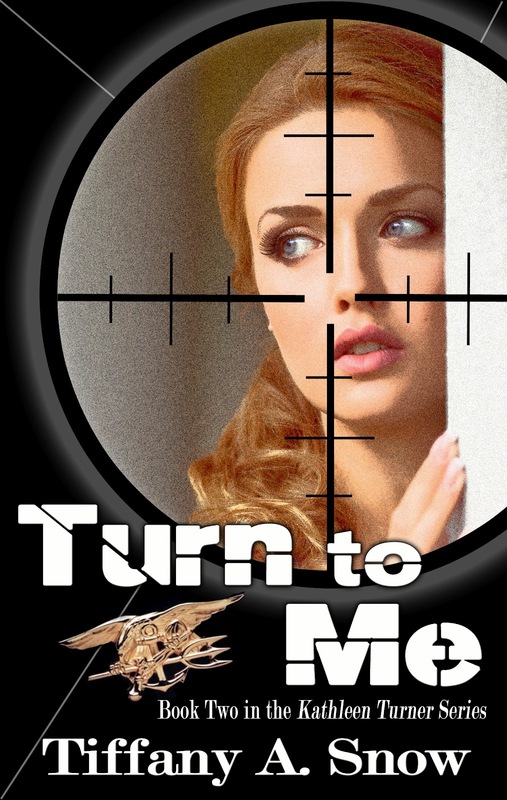 In addition, TURN TO ME is available on BarnesandNoble.com for Nook – also for $2.99. I’m giving away an ebook copy of TURN TO ME today – reader’s choice on which version they prefer – or a print copy, if that’s the winner’s preference (continental US only for that one, please). Giveaway ends 9pm EST May 1st. Please supply your email in the post. You may use spaces or full text for security. (ex. jsmith at gmail dot com) If you do not wish to supply your email, or have trouble posting, please email justromanticsuspense @ gmail.com with a subject title of JRS GIVEAWAY to be entered in the current giveaway. I generally have mixed feelings about the first person, but it absolutely works in NO TURNING BACK. Can't wait to read this one-- and congrats on the release! I enjoy the first person, but the 3rd person narrative is such a fabulous way to get a peek into the minds of Kade and Blane.....helps add to the story for me. Loved them both, really looking forward to the next! Sure wish Blane would put Kandi in her place. I love Blane and Kathleen - hope you write more stories. I enjoy both first and third person. What a powerful scene, wondering why it was deleted. Congratulations on the release of Turn to Me; hope it's very successful for you. Thanks for the chance to win a copy! i just read your second book in the kathleen turner series. it's greattt!. please write another! What a great deleted scene. Did it just not 'fit' in the book? It seems to have lots of good information on characters and I can't wait to read more. Thanks for sharing. Very nice deleted scene. Sounds like a good book. I loved both these books and I am hooked on these two men! Can't wait for the next book in this series. Thanks for posting the scene. Looking forward to reading the Kathleen Turner books! Interesting book. Congrats on the release. Congrats on the release. I enjoy reading first person. As a newbie author, I write in first person and some people don't like to read it that way. Personally, its easier for me to write. I don't mind either 1st or 3rd POVs. I used to not like 1st person but then I forced myself to read one and it blew me away and cured me of that fast! It'll be interesting to see where this "outtake" fits in. Thanks so much for sharing!!! Some of you raised questions about why it was a "deleted" scene. I'm afraid I meant that phrase as more tongue-in-cheek. The Kathleen Turner Series books are told in the first person and I thought readers might wonder at a few things that were outside the main character's POV, hence "deleted." I couldn't put them in because, well, Kathleen wasn't there to witness it! But I had a lot of fun writing from Blane's perspective! I just found your books last week and read them both immediately! Love the characters and plots. Looking forward to a steamy romance scene with Kade! I would love for Kade to hook up with the girl from his youth at the foster home ( I forgot her name) and for Kat to get pregnant for real! Cant wait for the third book. Yup.... My thoughts exactly. I just hope Ms. Snow doesn't kill one of them. Kat needs to end up with Blane not Kade. I completely agree, but I just don't think Kade sees her in that way. I think it's too late. He's just too in love with Kat. But either way, I am DEFINITELY pulling for Blane. Although I'm guessing it won't be easy. I think Kathleen will realize she has stronger feelings for Kade than she thought. However, I think her feelings for Blane are much more powerful than that. I have loved both of these books. Hoping she ends up with Kade. Can't wait for the third one! I as well happened upon the first book on Amazon and loved it. I was sooooo excited to know that the second book was just released that I bought it right away. I am a huge fan of your books. Love the triangle but I agree, sharing does not seem to be the way the brothers would work it out. I am thinking Kat/Princess won't be able to handle the polictics and therefore end up with Kade but Branna would be my second choice for Kade. I just hope whatever happens it works out for all of them. What job besides The Drop does Kat have now - didn't Blane fire her? If Kade is her boss and he just left until June what is she going to do? So excited!! This will be a great Xmas gift- From Me , To Me!!! LOL! One of the comments was that Kade hooked up Branna - I can't agree more. I have written the third book in my head many times - but the outcome I see as the most logical from what I have gathered as the characters personalities is Kat and Blane do get together - but she keeps her apartment for a while and keeps him on his toes and that Kade and Branna get together - although there is jealousy from Branna and Blane as Kade and Kathleen relate to each other on such a deep level that is leaves Branna and Blane with mixed feelings and jealousyas they try to relate to their significant others as Kade and his "princess" do. What a great Christmas it will be with book # 3 being released. Oh I can't wait til christmas! I am so hooked and can't wait to see what happens!!! Read both books twice and can't tell you how much I have fallen in love with Blane :). Please but no matter what dont leave him heartbroken in any book. Can't wait to read third book. Christmas can't come soon enough! I love reading the "deleted" scenes, and have already read both books twice. Which I never do! Love the characters! Love the bad guy thing Blane has going. Love love love! I've found your books & read them both this week. I loved them, the plots are so well written & keep you guessing & the characters are just so likeable. Kathleen is a great character to read. Shes quirky, brave, clumsy, frustrating, kind hearted but mostly lovable & you just find yourself hoping that everything will work out for her, especially with all the scrapes she gets into. I love the guys & how you've gradually got to know them better & the whole love triangle thing is really interesting. Clearly both Blane & Kade love her & I find myself routing for both of them at different points in the book. I can't help feeling that she would be happier with Kade in the long run though. He seems to see her very clearly & they seem to connect on a deeper level. Blane seems to be heading for a political life & I can't see her ever truly being happy as a politicians 'wife' with all the demands that would entail no matter how much she loved him. Really looking forward to book 3! Just finished reading both books. Great characters along with the suspense and romance. Can't wait for the next book, my vote is for Blane, I hope we also hear more about CJ. I just finished reading the second book in this series, I do hope for more. After reading all the previous posts I see that so many of us agree the series should continue! I do think Blane and Kathleen should be together and Kade and Branna are a great match to. I just hope that Kathleen and Blane will go ahead and tell each other how much in love they are and get that part over with??? I have just finished reading the 2nd book and I want more. I want Kat to be with Blane but I hope Kade and Branna will get together. I do not want any of the main characters to die, please. I am looking forward to the 3rd book. LOVE the series so far...can't wait for the 3rd book!! I'm guessing Kathleen said something about "love" in her sleep while in the hospital and the brothers don't know who she was sleep talking about!!! I love them both but see a bro/sis bond could grow btwn Kat and Kade with him protecting her. -here's hoping for an EARLY release in Nov hehe!! Just finished book 2. Blane is a great guy, but still seems to see Kat as his pet - someone he takes care of without leting her have her say in the matter. Kade seems to really know her and care more about her thougths and feelings. The way the characters have developed, it definitely feels like Kat and Kade should be together!!! Kade can't walk away cold and brokenhearted after the horrible childhood he had! Dear Ms. Snow, thank you so much for letting us, the reader know the reason why Blane didn't pick up for Kathleen. It was good to see how protective and in love Blane is with Kathleen. I would love for Blane and Kathleen to get engaged/ married, and I would love to see Kandi's expression, it would be priceless. Kathleen , Blane, and Kade have abandonment issue, that's why I would like for Blane and Kathleen to end up together. It wouldn't be good for Kade and Kathleen to end up together, Kade would always think that Kathleen is thinking of Blane, and she probably would be, making their relationship sour. Plus Blane would hate them both for betraying him. Kade needs someone that loves him, and I can see him with Branna or CJ ( the computer wiz). Thank you Ms. Snow for such a great book series.